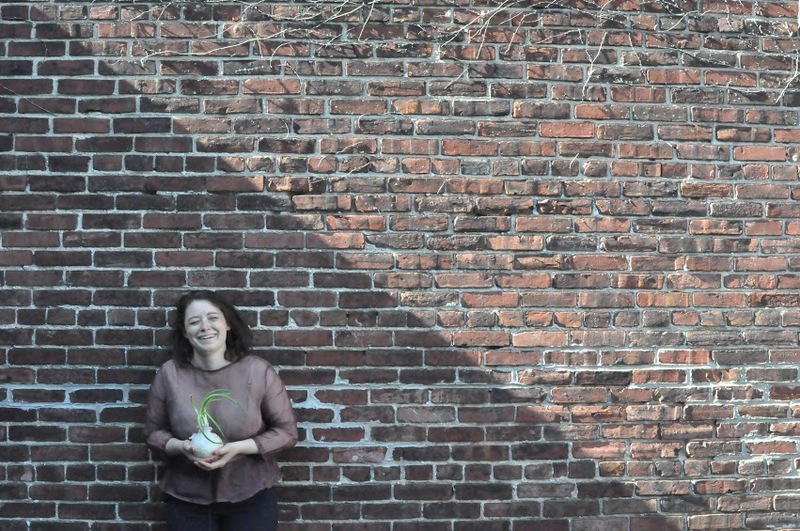 It’s Philly Fringe season! Help me bring my solo “Onion Dances” to the big stage. “Onion Dances” is uncooked, eager, inquisitive. It’s about unveiling layers, digging deeper, and finding visceral, full-bodied movement and full-bodied feelings. In this evening-length autobiographical solo I explore the idea of an inherited past as I attempt to dissect my past, present, and wavering future. As a Jew distinctly removed from the Holocaust but feeling a certain inherited trauma as a Jewish American, I am drawn to the idea of never understanding but wanting to understand. I am creating an oral history as an ongoing component of "Onion Dances" because my family has few written records of our ancestry. Through movement and text, I explore my Jewish American roots, as a descendent of Jews that came to the United States around the time of the Civil War. They were humanitarians, artists, peace activists, social workers, postal workers, clothing makers, liquour store owners, dentists, writers for Variety magazine, and much much more. Through “Onion Dances” I uncover their voices, as well as my own. “Onion Dances” first premiered at SoLowFest 2016, and is currently being expanded for the Philly Fringe. This great opportunity comes at a cost. Your contribution will go directly to space rentals, insurance, and production costs. In addition, it will help pay for costumes, props, publicity, transportation, and so much more. 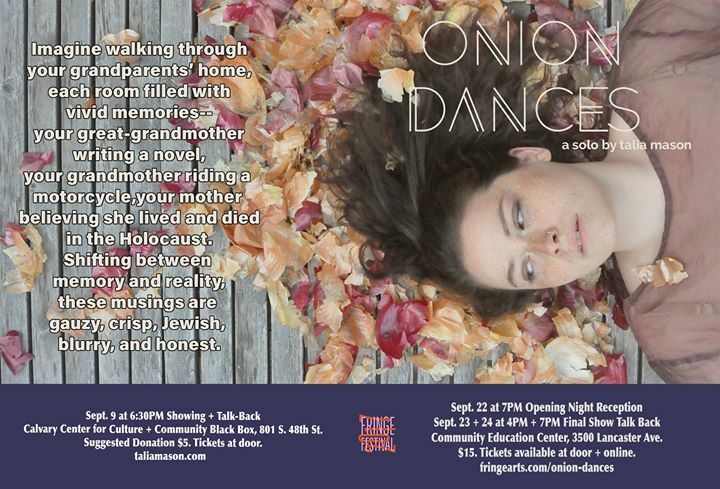 Please consider donating to support “Onion Dances.” I can’t thank you enough. Every bit counts. Come and venture into unknowing, into a world where onions and memories are fodder for conversation, for song, for dance. Thanks again for your support. I am so sorry for my major lapse in communication! Thanks to your support, Onion Dances was a smashing success, and I am already working on finding ways to tour the work and share it with a wider public. If you know of opportunities for me to perform excerpts of the work, or if you have ideas, please let me know! 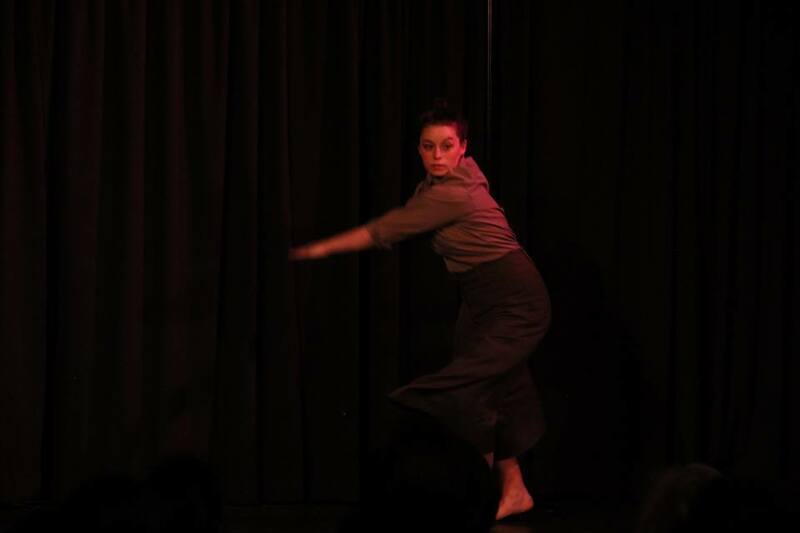 To all donors, I am sharing the content from the show with you--music and video footage from both the Fringe Festival and my recent performance at Movement Research! None of this work would be possible without your support. I feel lucky to be so loved and supported by you. Please know that this work blossomed thanks to your ideas, support, and the arms and ears that held and listened to me throughout the entire process. PS: Keep your eyes on my website and Facebook page for more information about Onion Dances comings and goings! Hey there friends of "Onion Dances"! The show is a week away, which I cannot believe, and I am so excited to share the work with you! The work feels personal, political, Jewish, nostalgic, and loaded with memories (good and bad). It's a little stinky, but it's a lot of fun, too. Get your tickets here: http://fringearts.com/onion-dances. The shows are Sept. 22 at 7PM (with my birthday party after the show!--because who doesn't like having a dance party in a theater with great treats from Essen Bakery! ), Sept. 23 and 24 at 4PM + 7PM. There will be a talk-back following the final show. Come, bring your friends, and bring some memories of family along with you. 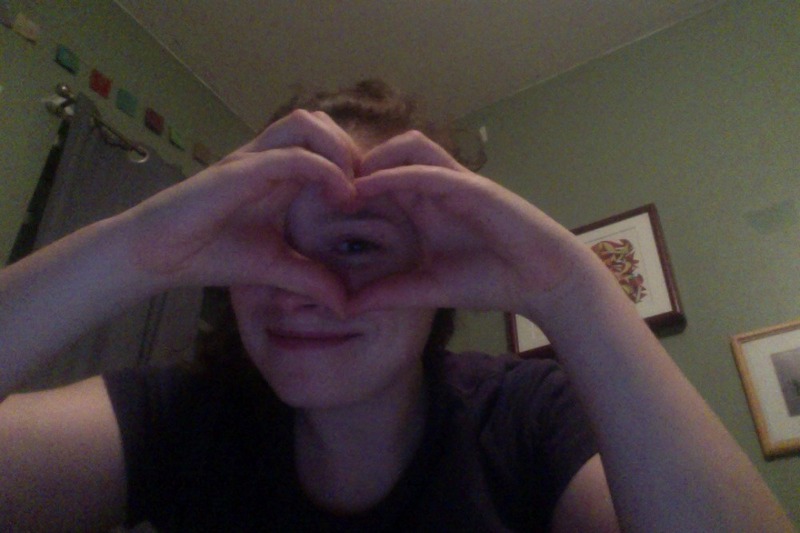 All my love to you, you amazing supporters! See you at the show! PS: Any questions? Shoot me an email! PPS: For supporters from afar: don't worry! You'll get a link or a DVD (depending on your preference!--shoot me an email about what you prefer) of the end product once we're through to the other side. PREMIERE NEXT WEEK! GET YOUR TICKETS! Onion Dances supporters, we did it! Thanks so much to everyone who contributed over the course of the past couple months, and a special shout out to my incredible aunt, Carol, who made it possible for us to make it to our goal of $3,500! Your contributions (whether small but mighty or big but slightly mightier) made a world of difference. My heart is so full, and so excited to share this work with you. Keep your eyes peeled on your digital and snail mailboxes for some goodies if you did donate, once Fringe is done! ALL my love to you-you made it happen! XOXOXO, Talia. Supporters of all things Onion Dances, we are officially THREE days away from our fundraising deadline and are $261 away from ensuring that all artists involved are paid fairly for their time! Please donate. That $15 goes a long way, really, and every dollar is accounted for. ALSO, for you already-supporters, here's some video footage taken by Stage Manager/Lighting Designer, and Dramaturg Logan Schulman @ Scratch Night last night! Check it out and support the work!! Donate this amount, and get a postcard with a personalized thank you note! You'll be getting some kind of something onion-related in the mail once the show is done! A couple goodies from the show! Surprises! Don't worry, they aren't stinky! You've done it! You're amazing. All the surprises AND more!